Lord, What Do You Really Want Me to Do? 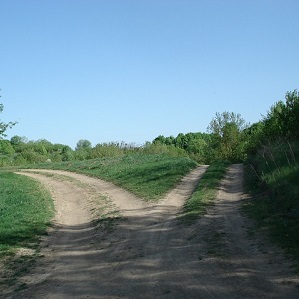 This past week I was wrestling with a choice between two paths. It was one of those matters that would significantly change the focus of my work and my family’s way of living. Either choice would have been good, but the difficulty was which path was God’s will. To remain here a poor monk in simplicity of the spirit? Is it a path to bring me nearer to you, or is it too easy a way, perhaps even a luxury? The path to holiness in this monastery is too effortless. I think it will be too easy to buy you like this, bargain price. It has pleased you to make me archbishop, and to set me like a solitary pawn face to face with the king on the chessboard. I think you mean me to defend your honor, peacefully if I can with argument and with compromise. And if I cannot, then with the full challenge of my office and the soaring force of what I know to be right. So I shall take up the mitre again, and the golden cope, and the great silver cross, and I shall go back and fight with the weapons it has pleased you to give me. For the rest, thy will be done. It is impossible for us to correctly guess what God wants us to do in every choice in life, and even those that we think are most important may in fact be the least important in His plan for us. However, we should still strive to do what we can best discern to be His will. Assessing what strengths and talents He has bestowed on us, or as Becket calls them “the weapons it has pleased you to give me.” Considering also the needs of those that share the time and place in which God has placed you, or whose needs have been made persistently and clearly to you so that you can meet them. Finally, recalling that He has called us to deny ourselves, reach beyond our comfort zones for the courageous thing to do; very often He answers our prayers of “Disturb us, Lord,” though in unexpected ways. Once we have decided on a path, with prayer and consultation with whose whom you share your life, pray for the strength to persevere. Accept though all trials of your calling that His will be done, just as you have prayed that His will be known when you set out.